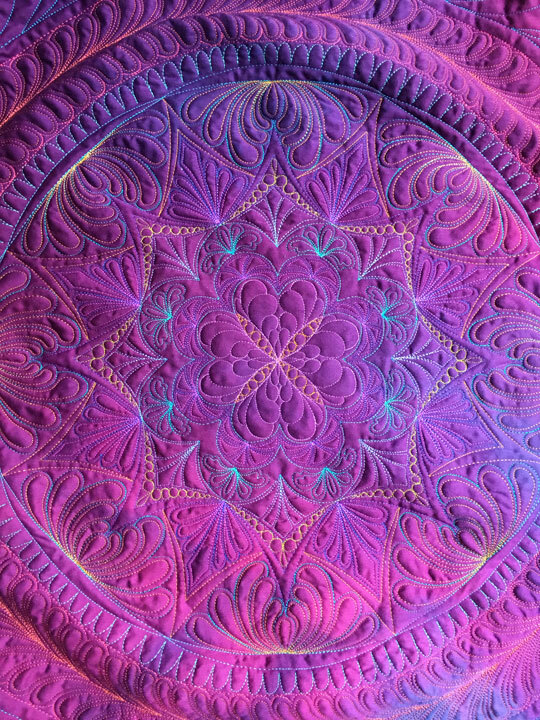 This is the center of a very complex and large feathered wreath. 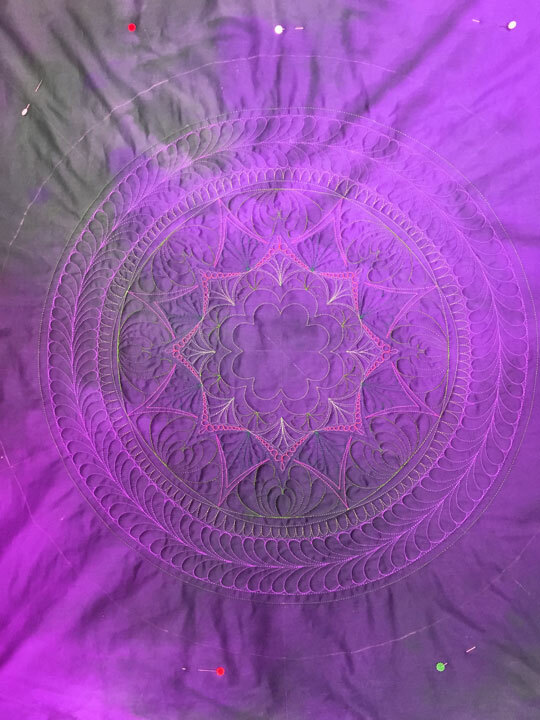 It was created using ruler work, then “decorated” with free motion quilting inside the various “zones” of the spine that were created using rulers. 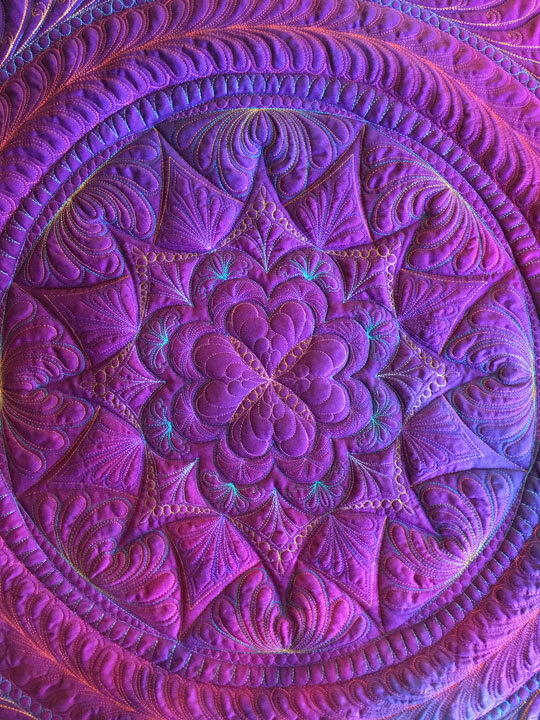 When you have a complex quilted design like this one, using variable levels of trapunto inside different zones will help define those zones better. This is important because it means that you can kind of control how the viewer will perceive the design. 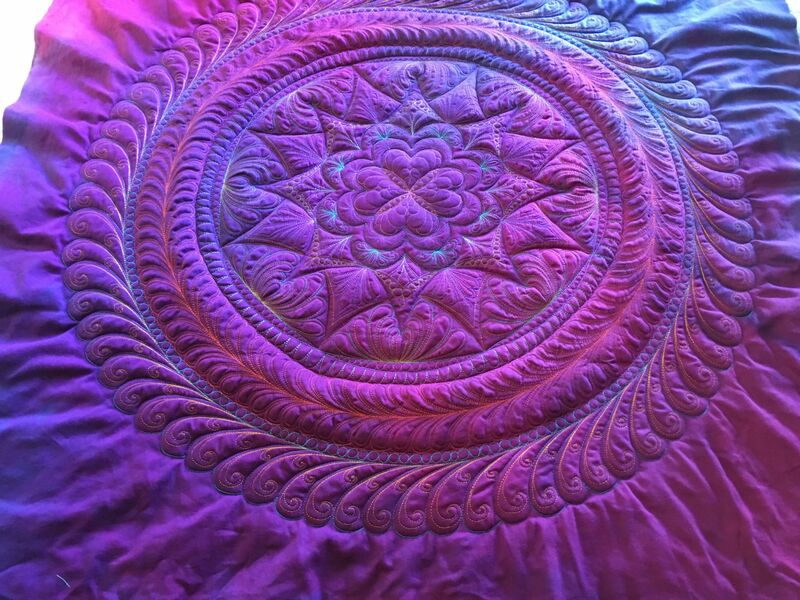 On top of that, the work is much easier to do since all of the highly detailed quilting is done before the quilt is in the final quilt sandwich, so you are dealing with a smaller and lighter piece that is easy to move around your machine bed. 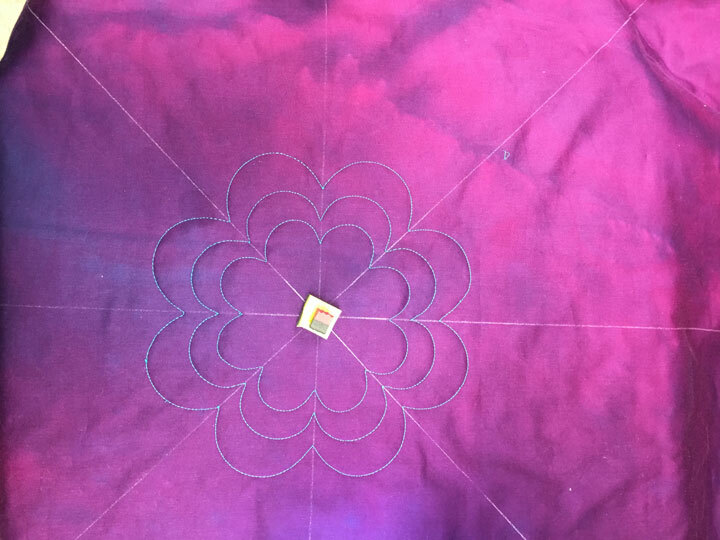 One of the challenges in working on a multi-colored base fabric is choosing thread colors that will show. 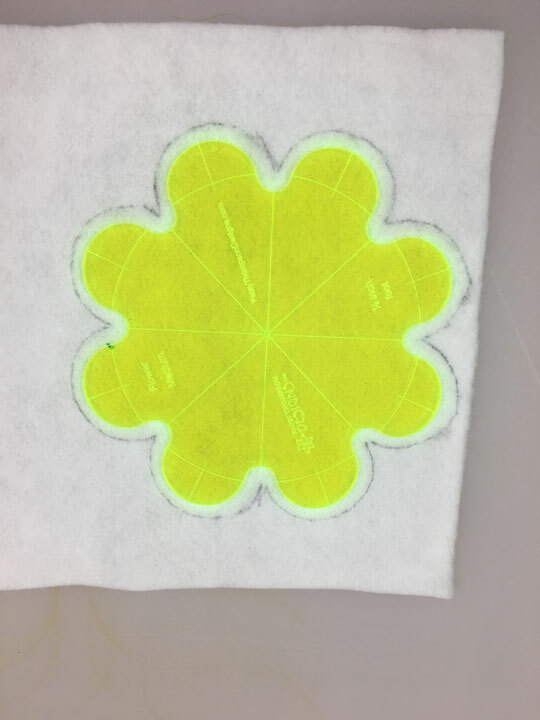 I try to save my high contrast thread colors for the areas where I really need the design to pop. 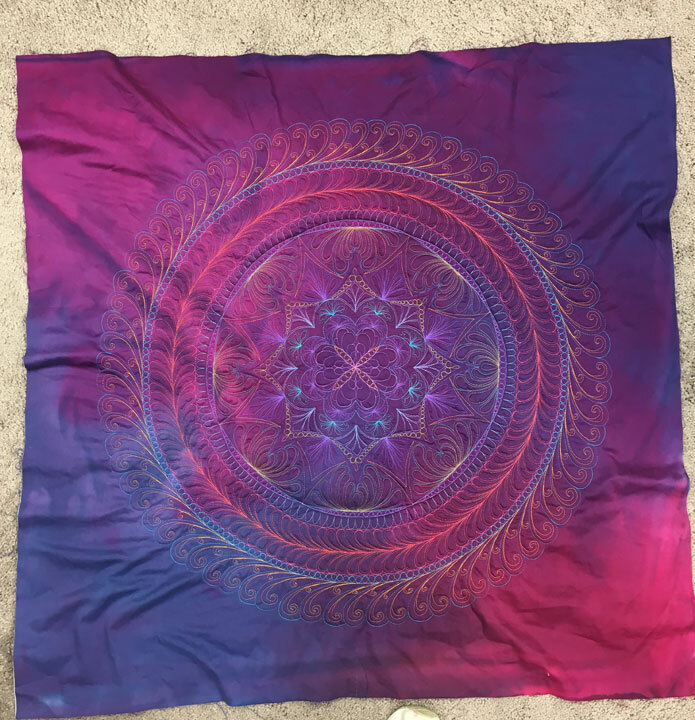 There were so many layers to this design that it would take to long to post it all here. In this next shot, I’ve added 3 concentric circles around that earlier design. Do you see a white soap line of a circle that encircles the entire thing? 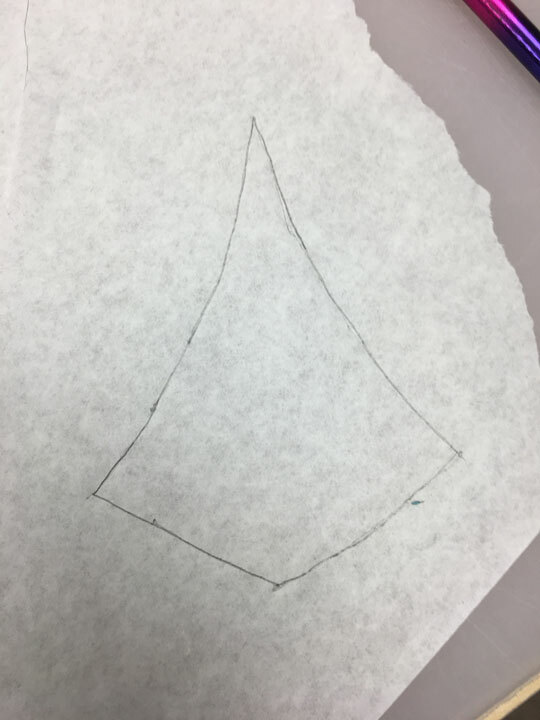 That is my temporary boundary line that I’ll use to guide me as I stitch the plumes along the outer edge of the circle. 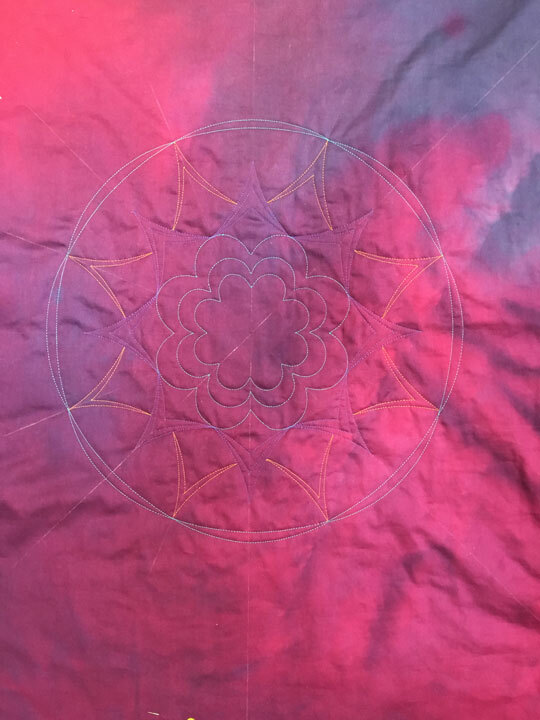 I actually had to draw that boundary before I did the stitching of the other circles so that I could figure out how wide my spine zone could ultimately be. 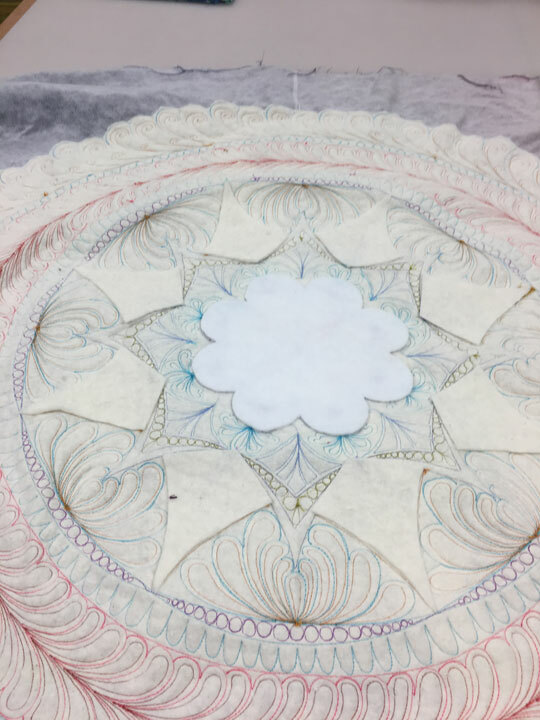 I used my oversize set of Westalee Circles on Quilts templates for some of these circles. For others, I used my PTD shallow arc rulers. 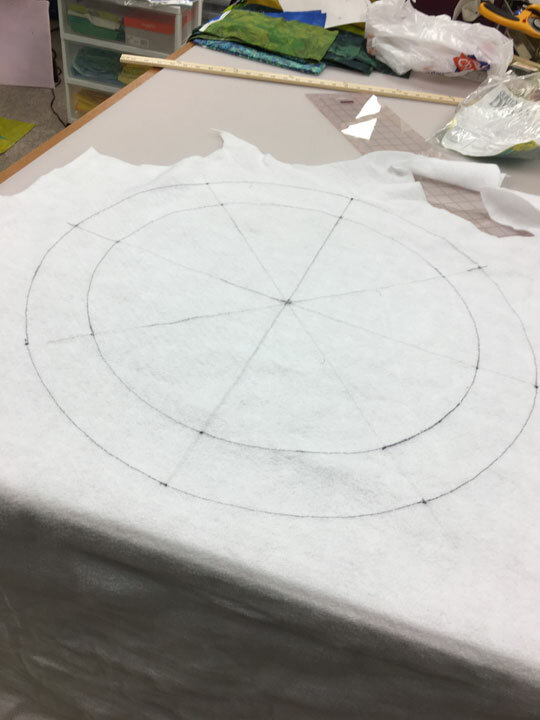 I can get away with this because I know that all our PTD arc rulers are cut from circles (as opposed to arcs), so I can use a PTD 30 arc to stitch/draw a 30 inch diameter circle, a 24 arc to stitch or draw a 24 inch diamter circle, etc. You can see that I’ve begun a lot of the fill-in work in the shot above. 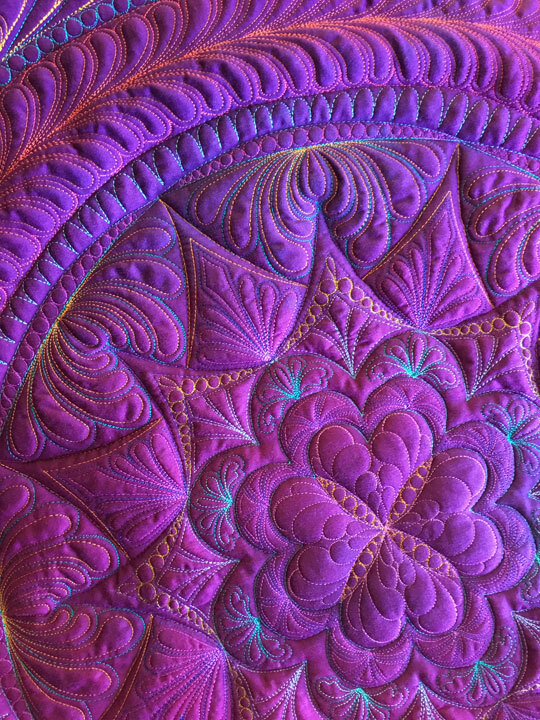 I try to avoid much hyperquilting until I’ve got a fairly even expanse of fill-in, but sometimes I can’t help myself. In this next shot, I’ve added the outermost plumes. The feathered wreath is a 30 inch diameter feathered wreath. Do you understand now what I meant about the heart palpitations?! 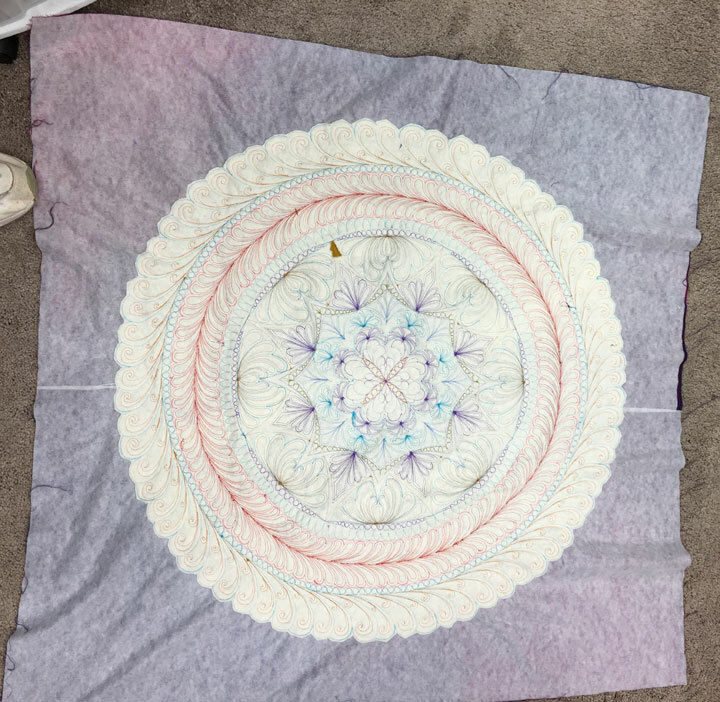 Trust me, the quilted wreath itselkf does not come close to lying flat either, so there’s far more to worry about than what this photo illustrates! So, at this stage, there is one layer of batting underneath the entire wreath. 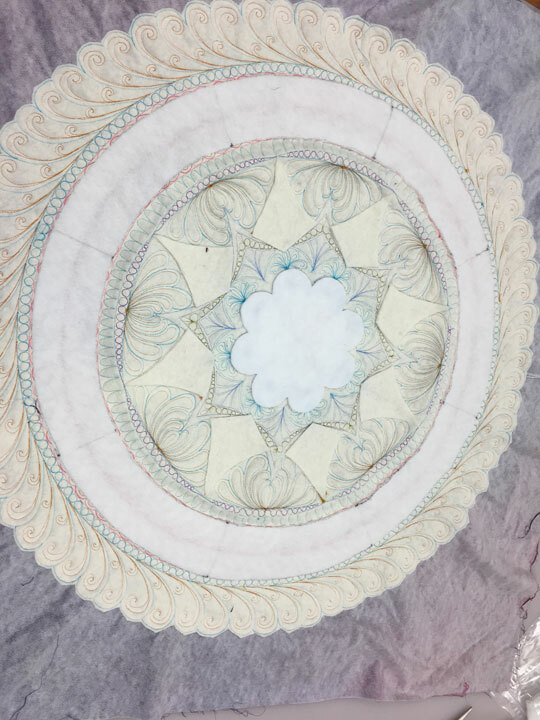 Know that the white stuff you see on the backside of the fabric is a layer of lightweight fusible interfacing (Pellon 845FW Designer’s Lite, to be specific.) You don’t need to do this when you’re creating a trapuntoed project. The only reason I am using it is the fabric is a cotton sateen. 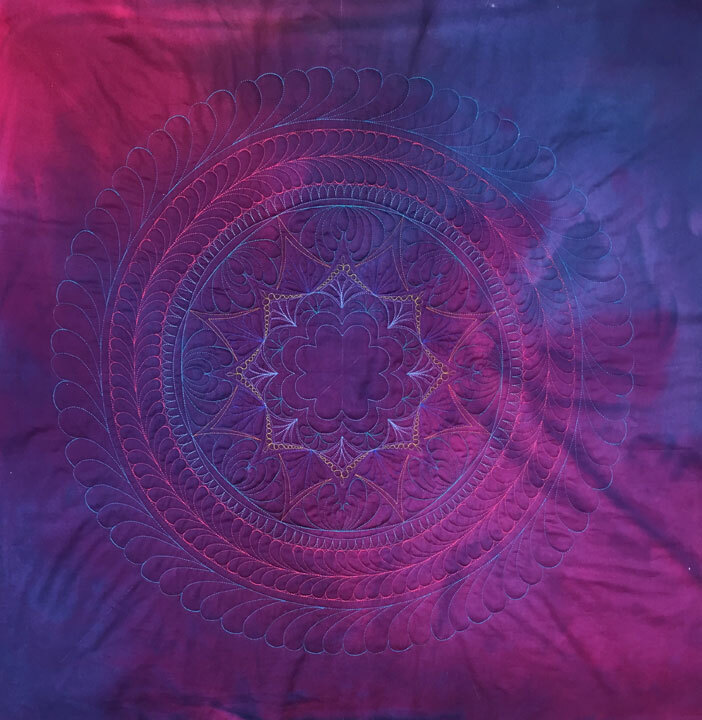 This is a beautiful fabric but it is a twill and can sometimes be a bit of a “shape shifter,” if you know what I mean! For that reason, I now back it with fusible interfacing so it will behave more consistently. This is a super lightweight interfacing that will not alter the hand of the fabric. Can you see that the outer zone w/the continuous feather still balloons out a bit, in spite of that extra layer of trapunto batting? I think I’m going to have to go in and outline all those plumes with invisible thread. More to come later….